Coin boxes, Shoe boxes, and M5M boxes — what do these have in common? As we approach Hallowe’en I look back to when I was a young lass. How many of you readers remember going out all dressed up, those sweaty masks over your face and some home made costume, a grocery shopping bag or pillow case in your hands, ready to have them filled? 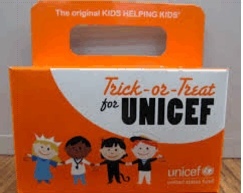 How many remember these little cardboard boxes given to us in school, to collect coins for UNICEF? This began in Canada in 1955 and continued for 50 years, stopping out of concern for the safety of the children and for other reasons. During the last 15 years Canadians donated on average of $3 Million. That is a LOT of coins to roll! With the money raised by the boxes and now with programs in the school, UNICEF is able to put a huge dent in many childhood diseases all over the world. That is not a trick but a huge treat for these children. 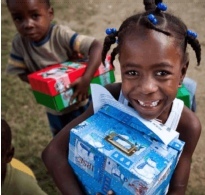 In 1993 Samaritan’s Purse began, on a small scale, a program called Operation Christmas Child. In 1994 I received information on this program and decided it was something that any one could do, no matter their race, age, religion, or whatever! So in 1995 I had the privilege of introducing this program to the whole North Eastern Ontario via CBC radio, Timmins Times, and the Timmins Daily Press. They were all great supporters – and still are to this day. It is a simple program of looking at a suggested list of items, purchasing them, and putting them in a shoe box. To date over 100 million shoe boxes have been delivered world wide. They went to areas that have faced huge disaster, where war is the norm for their lives, where poverty is rampant. Did these boxes change the children’s living conditions? No, of course not. But what they did — and still do — is let the children know that someone, somewhere else, cares enough about them to put this box together. It gives the children joy and HOPE. In 1994 a company called Mannatech began business in Dallas, TX. Over the years they have expanded their business to 26 different countries. 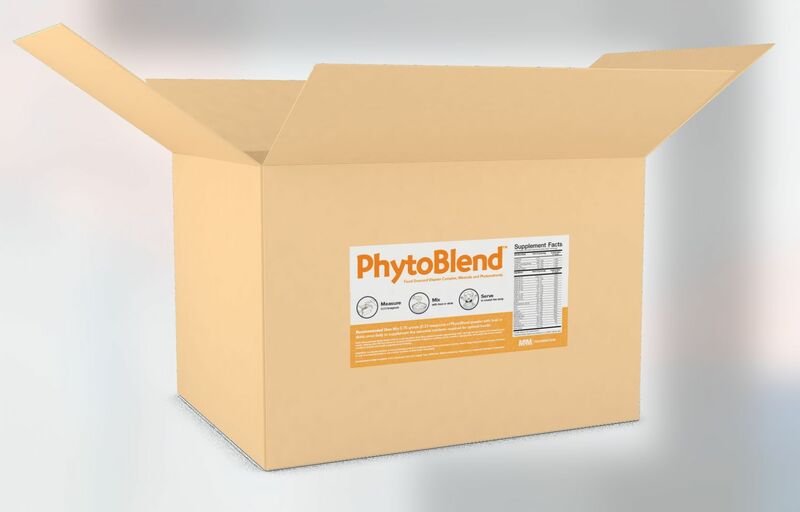 As a business they work through M5M Foundation, a US 501(c)3 charity to deliver the PhytoBlend powder. This is possible through the sales of all their products. Their aim is to add nutrition to the food for children in orphanages and feeding programs throughout the world to eradicate malnutrition. Just by adding that PhytoBlend powder to the child’s food the change is astonishing. So, what do these three things have in common? Children. And how these programs are used to help make life better and healthier for them world-wide. I am so thankful that I’ve been a part of UNICEF as a child (my box was always almost full!) and that I learned how important it was to think of others. Then through Operation Christmas Child and our business through Mannatech we continue this ministry. And we are not alone. Many are helping on this journey and the door is open for others to help us, especially with the year round M5M project. This entry was posted in News and tagged charity, Hallowe'en, M5M, M5M Foundation, malnourishment, MannaRelief boxes, Mannatech, nourishing children, Operation Christmas Child, orange boxes, orphanages, Samaritan's Purse, school feeding programs, shoe boxes, Social Entrepreneur, UNICEF on 2017-10-12 by peggy.